Is something just not right? Need to know the TRUTH? Colorado West Pro Serve & Investigations, LLC can help. 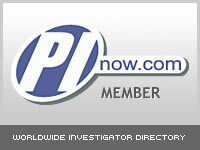 We are a Local Private Investigation company serving the western slope. We are licensed, bonded and insured in compliance with Colorado Statutes governing Private Investigators. Our beliefs stem from an old fashioned idea of excellent customer care. We listen to your needs and then put the solution into action. We take a personal approach to every case, and gladly welcome all questions. We will empower you with the truth and facts. Electronic Surveillance available. Click here to list of searches!